The most accurate description of the shrieking pageantry we’ve come to know as InfoWars is that it’s a dietary supplement business hiding behind a debased, unreliable, and exhaustingly stupid news network. 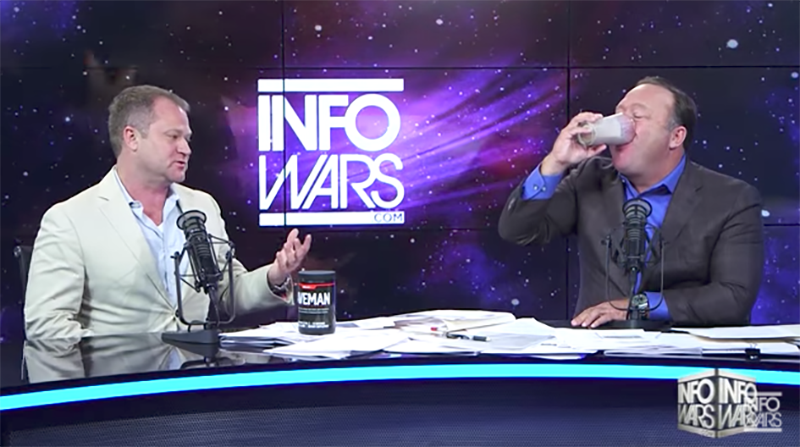 Unfortunately for its founder Alex Jones, seen above chugging a glass of “Caveman True Paleo Formula,” two of those supplements were recently found to contain high levels of lead. Besides this Neanderthal Pre-Human Drink Powder, another supplement called Myco-ZX, advertised as “potent herbs and enzymes” intended for the “detoxification of yeast and undesirable fungal organisms,” was also determined to have high levels of lead, according to an independent testing by watchdog group the Center for Environmental Health, the findings of which InfoWars has itself based articles on prior. According to the CEH, which purchased the samples tested directly from the InfoWars online shop, “People who take the Myco-ZX product would ingest more than six times the daily limit for lead under California law.” Those taking Caveman True Paleo would ingest twice the Californian daily lead limit. Caveman True Paleo, according to Jones on-air, can relieve muscle soreness, improve bone strength, and “doesn’t have additives.” Lead, according to the CEH, can lead to heart disease, high blood pressure, and (in men) lowered sperm count. But hey, who are you going to believe? The Proposition 65 limit of 0.5 mcg / day for lead is far below the amount of lead found naturally in the ingredients and food around you that growns (sic) on clean, non-contaminated soils. Various countries and safety organizations have reviewed known studies and science to produce guidelines on the levels of heavy metals that can be consumed dailiy (sic) without causing harm that take that fact into account. Should the Prop 65 page also disappear under mysterious circumstances, it’s archived here. We’ve reached out to Infowars for an explanation.